This lovely picture tweeted by Michelle Blair last year shows a group of young actors that were together in the 1998 London revival of Stephen Sondheim’s Into the Woods at Donmar Warehouse. 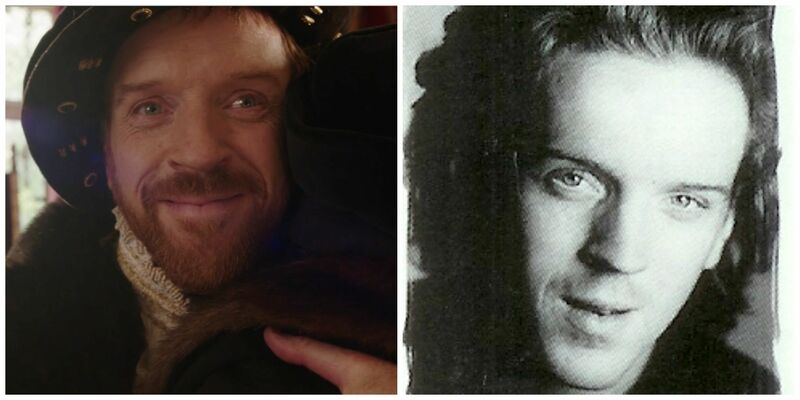 Our “Fan Fun” Countdown to The Goat, or Who is Sylvia continues today with the only musical Damian Lewis has done to date. 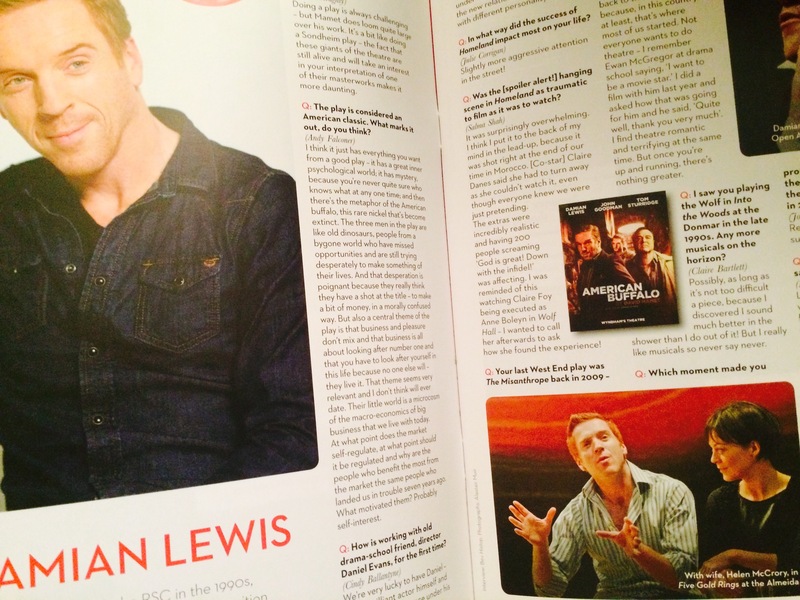 Well, I told you earlier about American Buffalo programme booklet having fun questions asked by fans and answered by Damian Lewis! Oh, yeah! Way earlier than being the big, bad wolf Henry in Wolf Hall, Damian Lewis was the Wolf in Into the Woods. Damian was cast as the Wolf/Cinderella’s Prince in the 1998 London revival of Into the Woods, one of Stephen Sondheim’s greatest musicals. The revival opened at the Donmar Warehouse on 16 November 1998, and closed on 13 February 1999. Damian Lewis LOVES Singing Show Tunes! Author DamianistaPosted on October 31, 2016 February 15, 2017 Categories Homeland, Into the Woods, MusingsTags Claire Danes, Maggie Siff, Mandy Patinkin, Nicholas BrodyLeave a comment on Damian Lewis LOVES Singing Show Tunes! I told you earlier about the American Buffalo programme booklet that has fun questions asked by fans and answered by Damian Lewis! Oh, yeah! Way earlier than being the big, bad wolf Henry inWolf Hall, Damian Lewis was the Wolf in Into the Woods. 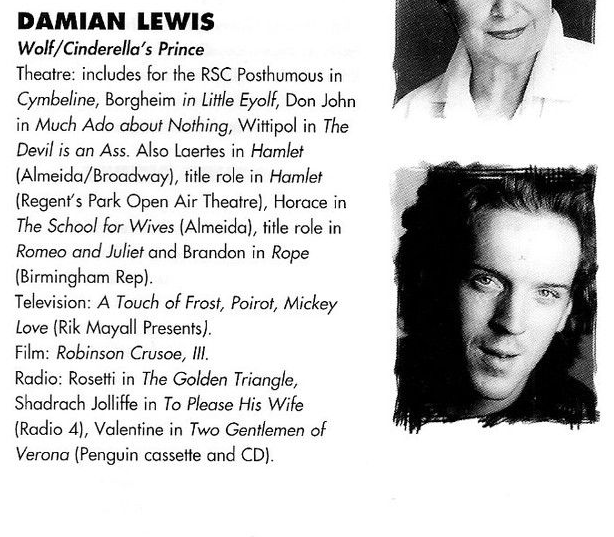 Here is a lovely pic along with his theater, TV and film credits from the 1998 London Playbill for the musical.